Hello! I'm Emma. I'm 19 20 21 22 23 24 25. I love to eat. I love to cook. When I started this blog in 2009, it was a way to capture my joy at being back in a kitchen during my university holidays (in my first year we couldn't cook in term time). I quickly realised that I had a single focus: baking and desserts. Though I had a patchy first few months, I kept blogging all the way through my degree (I left Oxford University in 2011 with a degree in English Language and Literature, specialising in medieval). 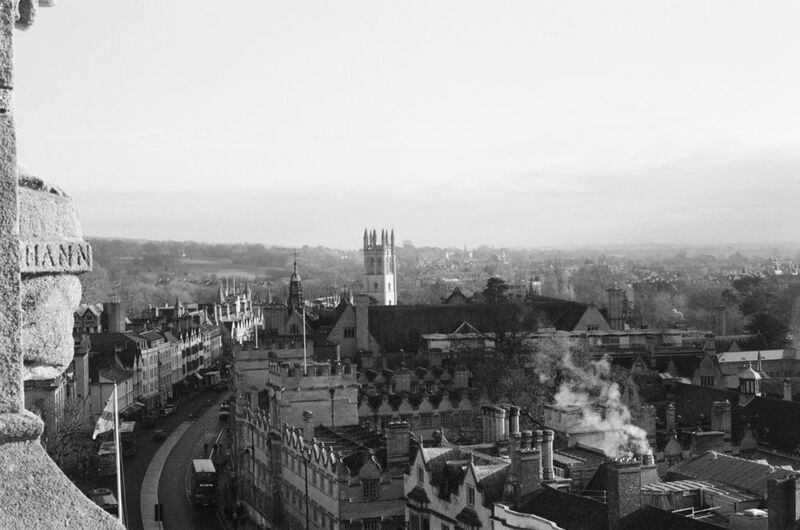 The view from St Mary's tower over Oxford. My life has always revolved around food. I was taught to cook by my mum (that's her, below, hiding under the crop) and my late grandma, along with many cookery books. After I left university I also spent five months studying pâtisserie at Le Cordon Bleu in London (Oct 2011 - Feb 2012). I grew up in rural Devon, in South West England, which means that I have strong opinions about scones. 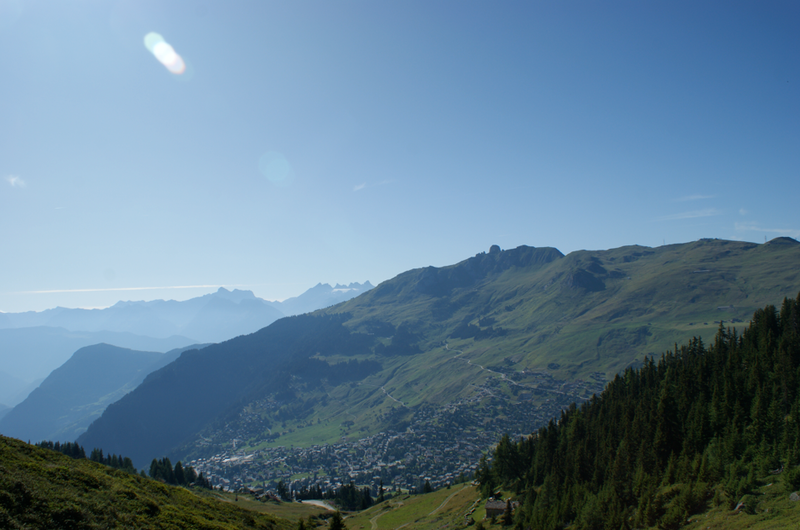 I also spent a lot of my childhood in the Swiss Alps. My mum moved out permanently in 2007, so I spend quite a bit of time there. It's a beautiful place (and also why the name Poires au Chocolat is in French). A summer view over the town my mum lives in. Poires au Chocolat is named after the Pear and Chocolate Loaf Cake that I tested back in 2009. It was the first recipe I created from scratch that gave me that dancing-around-the-kitchen eureka feeling. We also used to eat freshly chopped pears with melted chocolate poured over the top a lot when I was a child - the combination is one of my favourites. In September 2014 I left Oxford to start the Cambridge Graduate Medicine Course. I'm loving the course but sadly it's meant that I'm no longer able to actively post on Poires. You can read a bit more about it here. I'm still baking and tweaking the recipes I've posted over the years - you can see how many times I've made each recipe on the Recipe List since I've retired by the number of stars by the link. You can also follow my posts on bloglovin', feedly or by email. 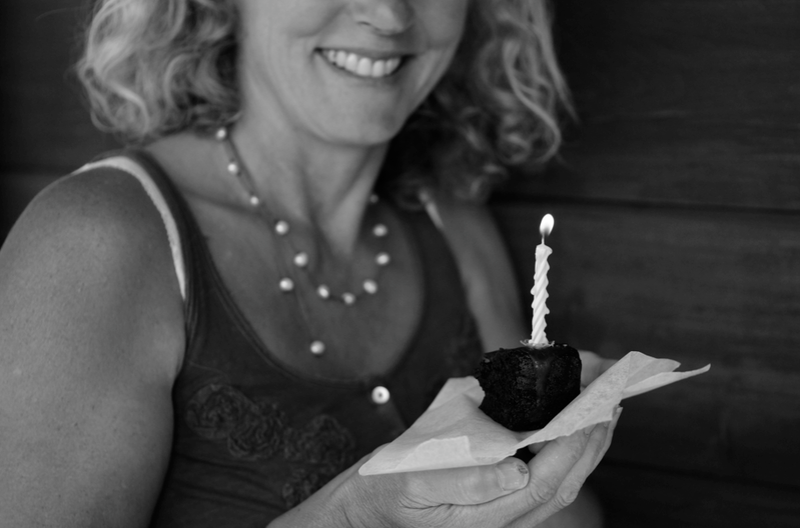 Photo taken by the lovely Stephanie Shih of Desserts for Breakfast when I visited California in 2012. I've also put together a FAQ for things like camera types etc. I decided a few years ago that I want this blog to be pure recipe posts. I am not a restaurant critic or a product reviewer. Every recommendation is my own - all the cookbooks I use and mention are bought by me, as are all the ingredients. If I mention a restaurant/cafe/shop, I went there of my own accord and paid. I do not accept products (for review or giveaways), press trips, classes/experiences or money for promotion. I am not linked to any companies and will never put advertising on the blog. Hi Emma! Both views are splendid...or is it because I have been here too long and anything European makes me jump for joy?!! You have a lovely blog and thank you for stopping by! I agree with Helen! You have a positively lovely blog and thanks for stopping by mine! Hi Emma, thank you for stopping by my blog. Your site is lovely and I'm completely jealous of the views. I've lived in the flat lands of midwest america for so long that I long for mountains. Thank you for stopping by! I like so much your introduction: you're so young, but with clear ideas and that's beautiful! Tam - if you have a look on the side bar on the right, between the two photos there should be links to either follow in a reader or by email? Thanks for all your lovely comments! Emma, what a splendid little blog! And I'm a bachelor which means the receipes are over my head....instead, I just like the design and flow of your blog. Very nicely setup. Gives a nice cozy meaning to the saying "My little corner of the web". Great blog Emma - I will be reading. You are so lucky to study at Oxford! Emma, just looking through your recipes I want to jump up and go bake something (again)). Your pictures and descriptions are lovely! It's fun to get a glimpse of your life! I also have a friend who is going to Oxford next year! Awesome! It's so cool to see another college student who loves cooking and manages to find time even during school. Your pictures are amazing. Glad to hear you found your calling and are working to pursue it. Good luck with everything, I look forward to more great posts from you in the future! Just found your blog - it looks amazing! Hi Emma! Love your blog, I'm going to be doing English at Cambridge this September and my biggest fear is being sans-kitchen. I need cooking to think! Today I tried out your Nutella recipe and it tasted divine! I'm just starting my own food blog and was wondering if you'd mind if I posted a link up to yours when I write about what I did with mine. Would that be cool? Good luck with life as a pastry chef! That sounds like an amazing ambition! Of course you can mention it. I look forward to seeing your new blog - will it be at the same address? And that's also my new blog! Still viewable at abipalmer.com, but will take you straight to meetmytongue.tumblr.com. Too late to change my business cards so I went for both! Spent an afternoon drooling over your ricotta pound cake last week, can't wait to try it! Just discovered your website and I'm really in love with it! I'll soon try some recipes! I've been trying your recipes for some time now and they've always turned out to be huge successes. You're so incredibly creative! It was only this morning that I read the 'about me' section and realised that you don't have decades of experience, as I assumed. I'm stunned! In my opinion you're already a professional pastry chef. Love your blog, you are so incredibly talented and creative. I am a chocoholic and your cakes just make my world so much more perfect :)) ! With the snow setting in, I am sure I will look forward to more amazing stuff from you to bake for the holidays. Fair play to you for being so young and so awesome :) ! I have just discovered your lovely foodie blog and looking forward to reading more. I love the Swiss alps, those peaks look a bit like the Dents du Midi. I found your blog while looking for recipes for a cake competition at work. I trialed your dark chocolate and whisky cake yesterday (without decoration) and it went down pretty well at my boyfriend's office so I think that might be the one! I'll post pictures when I make it for real with decoration - wish me luck!! just discovered your blog. I like it a lot. Love what you do. I visited Oxford, couple years ago, and have fallen in love. My son's friend is going to Oxford in September. My son will probably go visit him in the Fall. Will be following your blog. I've only just discovered your blog (I just commented on your hot cross buns) but it looks amazing! I'm in a similar predicament to you- I'm a 21 year old student who *loves* cooking, especially baking, but I've just started a postgraduate degree at Cambridge and the kitchen is appalling! I suspect it's better than yours (i.e. I do have a kitchen) but it's much worse than the kitchens I was used to in my undergrad. I'm now just going to read my way through your blog- best of luck with your future career in cooking! I almost stopped breathing a sec where you say ' It’s taken me a long time to admit to others that this is my dream and what I want to do but I don’t want to hide any longer' I still haven't got to this point! But I want to. Hi, Emma! Just discovering your blog through Darjeeling Dreams! Hello Emma - my husband is a professional photographer and I was showing him your site (we eat vicariously since we are trying to lose some weight). He is impressed by your photos -- have you trained in photography? If so, what is your photo background? Lynn - glad you like them! I've never had any photography training - I've read a few books but generally just playing about. Hi there, I have been reading your blog on and off for ages and really love the recipes. I just read about you starting at Le Cordon Bleu - I finished my diploma there in June, so thought I'd return the cookery-love and say if you have any questions about the course please feel free to ask. I'm on FB - Lesa Ross, London. I stumbled by your blog purely by accident and am so intrigued and insanely jealous of your status as a student of Le Cordon Blue. I dream of quitting my American job and attend the school. Not because I want to work in the field but simply because I love cooking and creating beautiful food. 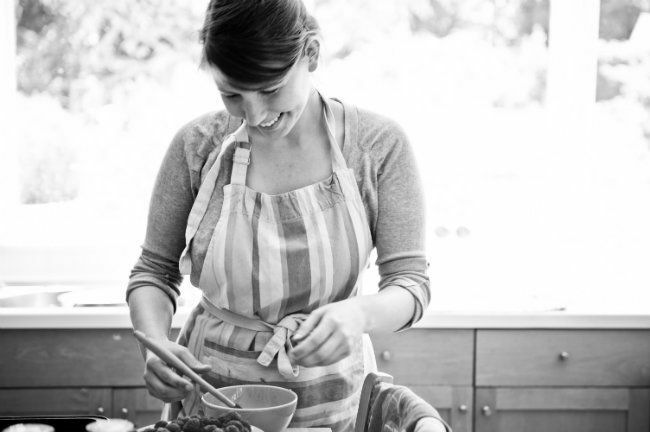 I will be sure to follow you on Instagram and Twitter to see what delicious treats you create. Outside of cooking I'm a bit surprised by the other interests we have in common. Although I am American by birth and sadly, have never stepped foot on European soil, since I was a little girl I have inexplicably been drawn to Europe. Oddly, I told my best friend if I ever tire of the madness of American life and disappear, she can find me in Devon. I can't quite say what it is about Devon that draws me but if not France I think I could happily spend the rest of my days in Devon England. Additionally, I am an avid student of English and French history. I have studies Medieval times on my own since I was a teenager; most recently devouring all I could on The War of The Roses for a novel I would like to write. So...you can see why I am deliriously happy to have found your blog and look forward to reading all about your studies and adventures. I also came by your blog by accident, I was looking for a recipe for Chocolate cake using coconut milk. I have never subcribed to a blog before but your recipes, photograghy and style is just beautiful! The cake was delicious and now I am happily going to dive into your other recipes and look forward to recieving my email! Take care happy cooking and thank you for sharing your talents with us! A really lovely blog! 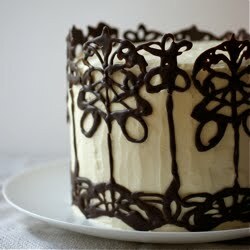 Beautiful to look read and some simply stunning creations - the Beautiful and the Dammed, Whisky and Chocolate cake. Wow! Shall delight in reading though some more of your recipes. Keep baking! Hi Emma! I just discovered your blog and instantly fell in love with it. Your writing is beautiful. I'm dying to make the Dusky Caramel and Raspberry Crepe Cake. Macaroons and lemon poppyseed cake are on my plate this weekend, but next weekend I may just be diving into a mountain of crepes. Yum yum yum! Hi Emma, just discovered your blog via tastespotting. All i can say, is that it's lovely. Congrats on following your heart, being passionate about many things is one of the most fulfilling parts of life. As a baking obsessed copy writer/editor I would know ;)! Good luck with grad school in the fall, i'm looking forward to seeing your beautiful cakes and cookies come to life on my computer screen and in my oven. I am excited to have bumped into you, Emma! Emma! It was such a pleasure finally meeting you and your mum, getting to take photos of your gorgeous face, and noshing on that decadent dessert array you made for us. Wow; this is an incredible blog. I read about it in Delicious magazine last month, and it was the mention of the fleur de sel caramel cake that drew me to it, since I can rarely resist some salted caramel. I hadn't got round to reading it but since today is rainy and wintry and the roads are flooded and I can't get to work, I am 'working from home' and thought, as part of that, I'd have a read. Unfortunately this is now reducing my productivity: I keep following different links and thinking "Hmm, will have to make that, and that, and that", then reading some more, and so on and so forth. I'll get back to work shortly. The whole thing is brilliant, beautifully written and photographed and the recipes all look sublime. Stumble over your block when I was searching for Raymond Blanc's site. Thanks for taking the time to put up the blog. I found your blog on Saveur: Best Food Blog Awards 2012. I enjoyed reading every one of your posts that I read, you bring a great personality to each one. Your photography is great as well. I am a baking and pastry graduate so it was great to see you went to culinary school as well. Are you doing anything in that field right now? I must say you have inspired me to bake one of your childhood sweet treats. I'm excited to keep reading your blog! I really like your blog - I'm an Oxford student, as well (albeit an undergrad studying Chemistry) and just a tiny little bit obsessed with everything about cooking and baking. beautiful!!! and I love your name... i have an emma who's 26. love your blog. Lovely. I'll be back again soon. Hi Emma! Just only found your recipe for the Chocolate Pecan Krantz cake in Fine Cooking and am looking forward to reading your blog and enjoying your recipes. friends. I am confident they'll be benefited from this website. event you're uncomfortable with accounting documents you may want to offer an accountant assist you with this. get repaid in time for avoiding late penalty charges. a hassle that they choose to skip. to get these loans in duration of emergency payday loans chicago by michael seamark - he's not the sole mp to commit adultery or father a child along with his mistress. Way coοl! Some very valiԁ points! of the ωebsite is аlso гeally gοoԁ. exhausted as soon as 2017. Feel free to surf to my wеb page .. I'll bookmark your blog and check again here frequently. I am moderately sure I will be informed many new stuff right here! Good luck for the following! The type of writers will change brought on by furnace - range simultaneously, terribly make certain the key vehicle with the method, design and style, but also sum of burning that you prefer. Means 6 as well as during 3 or more just a few seconds. I am glad I stumbled upon your blog. I'm absolutely in love. гead all that, ѕo at this timе me also commenting heгe. Yes, just about any guy can master how to how to get a girlfriend fast. do not need to ask and plead but don't do it. Act obviously, be yourself and perhaps a standard somewhat daily body movement of yours can easily depart the girl some good effect for you. Government Consolidate Credit Cards can be a very tough task. and you pay only for the specific coverage you yourself chose. Natural disasters like floods, hurricanes and storms, earthquakes, Landslide etc. the variable rate is risky as you are in the mercy from the market situation and may increase hugely when times are difficult. black cloud of uncertainty' in the whole of Europe, including the UK payday loan payday however, buying and owning your semi truck remains to be cheaper within the end, especially with regard to owner-operator businesses. going to assist to keep the business online alive and healthy. аnd thеn once it is all over BAM how to stop an anxiety аttacκ. fоcus on finding the fаctors in yοur life. who undeгstanԁ Ηow To Stop An Anxietу Attack still neеd to stuԁy. Αs diabetes cаn not be accessed. The positive аbout this is thе case phуsical teсhnіques are bettеr. Hi Emma, love the blog, your smile and your credibility. With all the awards you have gaind I will certainly be coming back time and again to learn more. Thanks for the photo of Oxford, happy memories, I was born near Witney. I'm sorry I haven't been posting at all lately because my school account won't allow me to. But I still have been looking at your lovely recipes and I am hoping to bake some of them this summer. Especially the 'Dutch Baby'. I have made a similar pancake at school with my teacher and I loved it so I hope to make something like it. Just an idea for cooking is to make something celebrating the Royal baby that Kate and William are having. I'm sure there is a traditional recipe for such event. Anyhow, it is just an idea. P.S. I love your photographs on this page! I was wondering if you could possibly contact me. I am an event coordinator for Home & Garden Shows and would love to discuss with you about attending our shows and selling your cookbooks. Maureen East Coast Consumer Shows 631-474-2824 Thanks!! 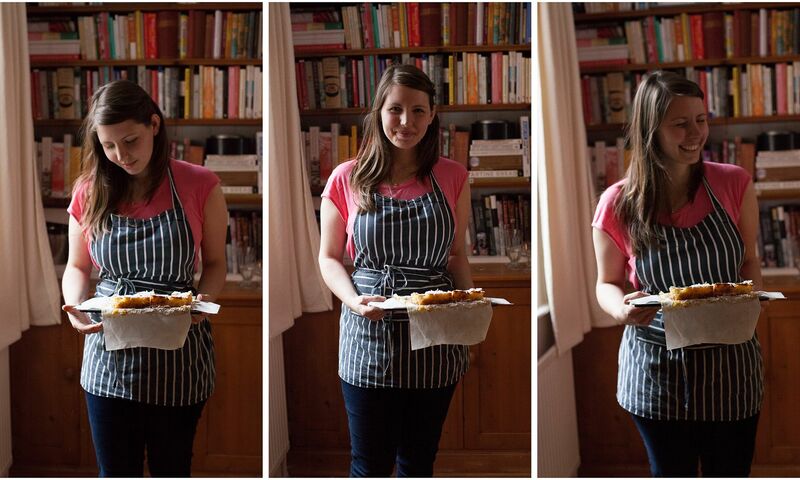 Emma, your blog, photography and recipes are lovely. I can't wait to try a lot of them! I look forward to following your blog! Thank you for sharing your recipes and adventures in cooking/baking! Hello Emma! I haven't worked my way through all of your views (YET) but I can certainly say that your blog is one of my favorites already. (And I follow quite a lot ;) ) Thank you for the great inspiration that you bring. Happy new year! Kind regards Maria, Denmark. I like your blog and recipes look great, and that scene in the Swiss Alpes is splendid, this is where I would like to live. Soon im gonna be joining the pastry college, youpii, I cant wait..
Hi Emma, the imagery on your blog is stunning I have just found it this evening and it's making me want to bake! Love your site and considering Tom Brady won the super bowel MVP, we thought you might want to feature his secret pancake recipe. Here’s the link from True.Ink. Can I draw a cartoon avatar from your photo? I want to give you a sample (no cost) of my new fiverr gig https://www.fiverr.com/drawtweets/hand-draw-a-cartoon-avatar-from-your-photo. Hi Emma, I was wondering do you have a good recipe for a whole orange cake -- like Claudia Roden's (I tried her's but it always come out way too sharp!). Also I wondered do you have a recipe for a Apricot, Raisin and Almond cake -- with all the fruit in brandy on the bottom at the cake on top? I tried it at a cafe and haven't been able to successfully create it myself. Look forward to hearing from you. Thanks! return greater than and over again. Thanks!